If abortion is outlawed, will thousands of women die in the “back alley”? Page Summary: Some justify abortion on the claim that if it is outlawed, women will abort anyway and may die in the process. There are 3 problems with this hypothesis. First, it doesn’t address the ethics of abortion. Second, laws against abortion would deter most women from having one. Third, there is no evidence that illegal abortions are more dangerous than legal abortions. The wire coat hanger has long been the prop of “choice” for those staging pro-abortion rallies or protests. You see them on signs and buttons and hanging around necks, all designed to symbolize what will happen to women if they ever lose the legal right to kill their unborn offspring. There are a couple of serious problems with this tactic and, ultimately, this line of thinking. First, the “coat hanger defense” has nothing to do with the ethics of abortion. It makes no attempt to justify the act, it simply argues that if women ever lose this right, they’ll die en masse from self-induced abortions. Those who make such an argument conveniently ignore the fact that abortion, itself, kills a living human being, not by accident but by design. It is completely backwards to argue that society must “keep it safe” for one human being to kill another human being, one who is completely innocent and defenseless. It is like arguing that we should legalize armed robbery because bank robbers might die in the process of holding up a bank. Laws must protect the potential victim, not the potential assailant. The second problem with these claims (that thousands of future women will die if abortion is outlawed) is that they have no solid historical basis. They’re just an emotionally charged smokescreen to divert attention from the grim reality of abortion itself. If abortion is outlawed in the future, it is true that some women will still have abortions, but most will not. The number of abortions performed in South Africa continues to increase every year: the number of abortions reported in 1997 was 26,519 and those reported in 2006 were 83,913¹. 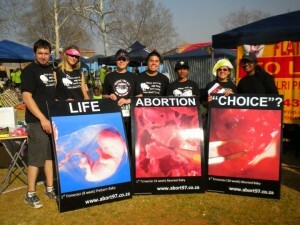 In other words, in a ten year span, abortion has increased by 316.43% in South Africa. If the legality of abortion didn’t influence a woman’s willingness to choose abortion, then we wouldn’t have seen such a massive increase in abortion frequency during the years following its legalization. Will any of the women who do abort illegally ever die? It’s possible (there are women who die each year from legal abortions), but the number of deaths will be no where near the 1.21 million who are currently dying every year from legal abortions in the U.S.
How many deaths were we talking about when abortion was illegal? In N.A.R.A.L., we generally emphasized the drama of the individual case, not the mass statistics, but when we spoke of the latter it was always “5,000 to 10,000 deaths a year.” I confess that I knew the figures were totally false, and I suppose the others did too if they stopped to think of it. But in the “morality” of our revolution, it was a useful figure, widely accepted, so why go out of our way to correct it with honest statistics? The overriding concern was to get the laws eliminated, and anything within reason that had to be done was permissible. Some 30 years ago it was judged that such deaths (from illegal abortion) might number 5,000 to 10,000 per year, but this rate even if it was approximately correct at the time, cannot be anywhere near the true rate now. The total number of deaths from all causes among women of reproductive age in the U.S. is not more than about 50,000 per year. The National Center for Health Statistics listed 235 deaths from abortion in 1965. Total mortality from illegal abortions was undoubtedly larger than that figure, but in all likelihood it was under 1,000. In the year prior to Roe v. Wade (1972), the Centers for Disease Control (CDC) reports in their Morbidity and Mortality Weekly Report (Sept. 4, 1992, Vol. 41, No. SS-5) that 39 women died from illegal abortion in the U.S (24 more died that year from legal abortions). That is a far cry from 10,000, and 10,000 speculative deaths is farther still from the 1.21 million actual deaths that are already happening each year through legal abortion. Such is true in America; such is surely true in South Africa, though the statistics and research are not available to corroborate it. Abortion is no longer a dangerous procedure. This applies not just to therapeutic abortions as performed in hospitals but also to so-called illegal abortions as done by physicians. In 1957 there were only 260 deaths in the whole country attributed to abortions of any kind. In New York City in 1921 there were 144 abortion deaths, In 1951 there were only 15; and , while the abortion death rate was going down so strikingly in that 30-year period, we know what happened to the population and the birth rate. Two corollary factors must be mentioned here: first, chemotherapy and antibiotics have come in, benefiting all surgical procedures as well as abortion. Second, and even more important, the conference estimated that 90 percent of all illegal abortions are presently being done by physicians. Call them what you will, abortionists or anything else, they are still physicians, trained as such; and many of them are in good standing in their communities. They must do a pretty good job if the death rate is as low as it is…abortion, whether therapeutic or illegal, is in the main no longer dangerous. In the end, the back-alley, coat-hanger abortion is nothing more than a convenient myth aimed at sparking emotions and arousing public sympathy. If abortion is outlawed in the future, some abortions will still take place, but just like illegal abortions before Roe, they will not be self-induced nor will they be performed by back-alley butchers. If abortion remains legal, however, millions of innocent human beings will continue to die, year after year, and this is both a tragedy and a huge injustice.